Hardwood Floor Maintenance: When Should You Sweep, Clean, and Refinish? 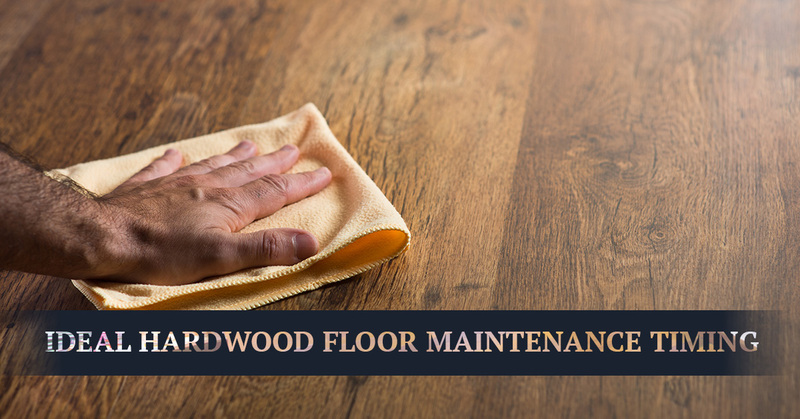 Whether you’re the proud owner of new, shiny hardwood floors or you’ve been around them your whole life, it helps to know the right timing of the most common maintenance routines related to this beautiful flooring material. With the right information, taking care of your wood flooring is easy and can extend its longevity. In fact, properly maintaining your floors can make them last for more than 100 years! In today’s article, we’ll share some tips on the timing of maintenance items for your wood floors. At Mountain Valley Floors in Loveland, we’re a Top Rated Local® flooring contractor, and we’ve been serving the Front Range with residential and commercial flooring solutions for more than 25 years. If you’re considering switching to luxurious hardwood, contact our team today to schedule a free consultation! The National Wood Flooring Association (NFWA) recommends sweeping your wood floors gently everyday to remove dust and dirt particles that can mar and dull the finish on your floor. This can be accomplished by sweeping with a good soft-bristled broom or dusting them with a gentle and dry microfiber mop. Daily maintenance can be challenging for some, but the more frequently this is done, the better your floors will look. If you have hardwood floors in your home, you know how essential it is to have a reliable vacuum on hand that has a bare floor setting. Some upright vacuums have this capability built in simply by turning off the beater bar. Other vacuums come with specific attachments to accomplish the task. Regardless of what type you use, be sure to vacuum your hardwood floors thoroughly once a week to remove larger debris from the surface, between cracks, and along the edges. 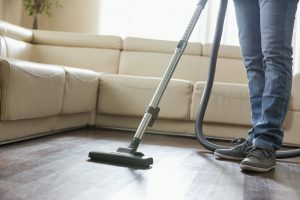 Depending on the amount of foot traffic and dirt tracked in your home, it is advantageous to give your floors a good cleaning once or twice a month with a gentle, professional cleaning solution and microfiber mop. Prior to any wet cleaning, be sure to take the time to thoroughly remove any dust, dirt, or other debris that’s accumulated since your last vacuuming to avoid scratching your floors. If they have light scratches or a dull finish to them, a light buff and coat completed by a professional flooring contractor can breathe new life and beauty into your floors. This can be done every three to five years as a preventative maintenance item. For deep gouges or damaged floors, a heavier sanding and refinishing may need to be done. Many homeowners won’t find themselves faced with finding a contractor for this task more frequently than every couple of decades, unless there is catastrophic damage from water or another source. For more tips on how to maintain your hardwood floors, or if you’re interested in a free consultation to discuss whether or not wood floors are right for your home, contact a friendly member of the Mountain Valley Floors team! We’ll gladly answer any questions and address any concerns that you have. Call us today at 970-372-4019 to get started! We can’t wait to hear from you!